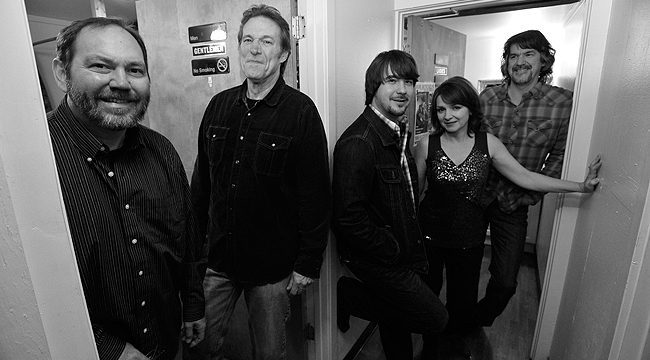 A few years back, a group of Nashville session players formed a band they called the SteelDrivers and started to play an inventive mix of bluegrass and soul. They began by playing a VFW Hall in Franklin, Tennessee, but as buzz about them grew, they graduated to bigger venues and started racking up the Grammys. Fiddle player Tammy Rogers recently phoned in to discuss recent line-up changes and how they’ve affected the band’s new album, Hammer Down. I read that Adele has been covering one of your songs. When did that start? I’m not exactly sure. I do know that after the 2009 Grammys when she had her album 19 out and was up for a few Grammys, we were also up for our first Grammy. She was touring the states at that point and as the story goes, her bus driver was a big fan of American music. She would sit up there late at night and smoke. He would play his music and he had one of our CDs and she fell in love with “If It Hadn’t Been For Love.” You can’t plan that kind of thing. The randomness is awesome. Were you all session players prior to forming? Yeah, pretty much. [Original singer-guitarist] Chris Stapleton wasn’t a session player per se, but he had a songwriting publishing deal. He and [former] mandolin player Mike Henderson had been writing together for four or five years. That’s how they started writing all these songs. He said they should start playing them out. It was a very casual thing at the beginning. Mike Henderson and I had worked together in the mid-’90s with the Dead Reckoners. We had done a bunch of gigs together and a bunch of live records together. That went on for a few years and our paths had crossed around town. Do you remember the first show you played as the SteelDrivers? Yeah, I want to say it was at the VFW Hall in Franklin, Tenn. We had been playing and it was feeling really good. We knew that if we booked an actual gig that a lot of people would show up because we were established and well-known. We wanted to make sure we were well rehearsed before we put it out there, so to speak. We practiced for six months and then we started doing these practice gigs. It gave us the chance to stand up in front of the microphones and work the kinks out. Where was your first Nashville gig? I think it was an out of the way gig at Brown’s Diner and then we booked a night at The Station Inn and it took off from there. Talk about your musical background. Did you grow up listening to bluegrass, soul or both? I definitely grew up listening more to bluegrass stuff. I jokingly say I was in a bluegrass vacuum until I was about 25. After that, I started listening to everything and anything. I always gravitated toward music that had that soul element to it, whether it was blues or R&B or any type of folk music like Jimmie Rodgers and the Carter Family. That was always the stuff that tended to have its basis in a soulful, blues place. Stevie Ray Vaughan and up through the modern players and bands that have that element. That’s what I’m into. Your first Grammy nomination must have opened some doors. Did it? It really did. It was amazing to have a Grammy nomination right out of the chute like that. We got a whole lot of notoriety immediately and the reviews were amazing. We did The Conan O’Brien Show and a lot of press on the national level. It made things happen pretty fast, that’s for sure. For me, I grew up dreaming of being in a bluegrass band and playing bluegrass for a living. I did the country stuff because opportunity opened up and it was great fun and I’m glad I did it. Reckless was so successful that it must have been a shock when Chris Stapleton announced he was leaving. It was, although knowing Chris [Stapleton] like I did — we were close pals — I knew he had a rock band on the side. They were starting to do gigs. He had gotten married. He had his first child. He was starting to have his first success as a songwriter. He had a lot of things going on. For me, I grew up dreaming of being in a bluegrass band and playing bluegrass for a living. I did the country stuff because opportunity opened up and it was great fun and I’m glad I did it. For him, it was the other way around. The SteelDrivers was a happy accident. He was happy for all the success, but he didn’t grow up dreaming of being in a bluegrass band. It’s the difference of where he was coming from. He’s gone on as a solo artist and signed with Universal. He’s gone out to write two or three more country hits and has a second child. He has a lot going on. How did Gary Nichols end up joining the band? When we knew that Chris was leaving, we knew we wanted to keep going. We enjoyed it enough that we knew if we could survive it, we would keep doing it. We started opening our minds to other options. I was thinking we needed to go in a completely different direction and not try to keep the same vocal sound. Those were such huge boots to fill that I just thought it wasn’t going to work and would be unfair to put someone in that position. The whole premise of the band has been everyone being their own person and not copying someone else. I didn’t want to put someone in the position where they had to sound like someone else. It was totally by accident that Mike Henderson’s wife stumbled upon Gary’s website and heard his voice. He called me the next day to see if I heard from him. He said he was from Muscle Shoals. The name sounded familiar but I didn’t know him. My husband is a session guy and he had done a lot of work done there. He knew him. I said, “Can you get his number?” He called me back in five minutes with his number. Mike called him up and told him about our band. It was just a meant-to-be situation. He showed up and he opened his mouth and we started smiling. Did Hammer Down come out easily? It actually did. We were set to go into the studio about 16 months ago, when Mike Henderson called us up and said he wasn’t up for touring and that it was a good time to step aside. That set us back, but we reached out to Brett. He had played with us before so he knew a lot of the material. It took us four or five months to get everything together. We were hoping that it would come out last year in the summer and didn’t but the recording of it came together as easily as the other two. What do you think has changed in your approach? I think it’s similar. We incorporate more instrumental stuff. Gary plays more lead guitar than Chris ever did and Brent plays more mandolin stuff. That’s kind of a new thing. As for vocally and what we’re looking for in material, it’s the same direction. What do you have planned for the year? We’re committed to working this album and getting out there and touring as much as we can this year. We’re really excited about it. This is the first time since the first album that we had the band on the record together out on tour and we’re looking forward to it.